A NEW shopping mall that will house 24 shops has been officially opened in Gwanda’s Central Business District, indicating growing investor interest in the mining town. Meek Shopping Mall trading as Kaweni Enterprises was built by a Gwanda small scale miner, Mr Philisani Ncube (29). 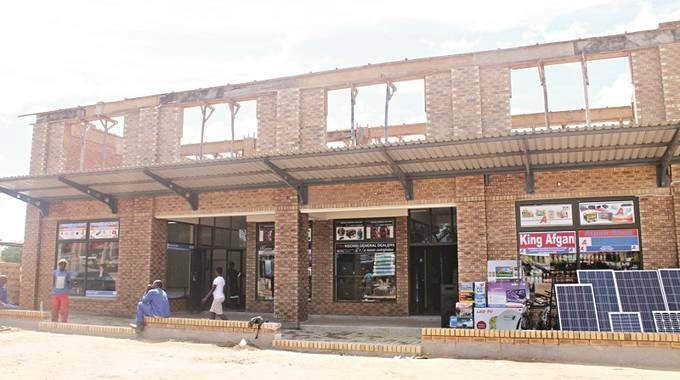 Matabeleland South Minister of State for Provincial Affairs Abednico Ncube officially commissioned the mall on Tuesday and urged locals to invest more in the town. “It’s pleasing to see local businesses growing. Kaweni Enterprises owns a number of buildings around town and the opening of this new one is a sign that indigenous companies are making huge strides in the business world,” he said. In an interview, the youthful entrepreneur said although some segments of the project were still under construction, the ground floor had been completed and was ready for use. “We are here today to commission this shopping place called Meek Shopping Mall. So far we have finished constructing the ground floor, which has 12 shops and most of the shops have now been opened as we have rented them out. The first floor is still under construction but we expect it be completed by end of May. It will also house 12 shops, which will bring the total number of shops in the mall to 24,” he said. “The mall will house shops that offer a variety of products such as groceries, clothing, general dealers, food outlets, salons, electrical among others. I realised that Gwanda has a great potential for business and that’s why I decided to venture into this project. As a small scale miner, Mr Ncube said he realised that it was also important to invest proceeds from mining into infrastructure development to assist in the growth of Gwanda town. He said construction of the mall began in February this year but would not reveal the value of the project. Minister Ncube said it was important for small to medium enterprises to have proper working space as they played a major role in the growth of the economy. He said Government alone could not provide these critical structures hence the need for private partners to invest in infrastructure development. The minister called on local businesses to continue contributing to local economic development and encouraged the youth to also find their niche.